Arthur came to one of our creative workshops for SAGE at Hayle, he was 65 years old and had suffered a stroke a year ago which left him unable to speak and partially paralysed on his left side, he had 60% use of his right hand and 10% use of his left hand. Arthur’s wife was with him during the session, she told me that Arthur was an architect before the stroke, running his own business with a team of six under him, since the stroke he had become very depressed and hadn’t done anything creative so it was going to be a challenge to get him interested in this. It was obvious Arthur was at the session under protest. The Workshop began with most of the others in the group enthusiastically working with the clay following my direction in making a character face. Arthur was just watching what was happening…which was fine by me. After about 15 minutes of observing Arthur took a lump of clay and started apply it to the Skull-ature supporting the Skull-ature with his left hand and working with his right. After a while I noticed that Arthur had applied the clay and started to make a face but was just working to the left hand side of it, quite natural when you consider his condition. He continued to do his own thing, making the one sided face more and more abstract. For me it was very satisfying to see Arthur using the clay and Skull-ature in his own way, allowing his own imagination to take over and explore aspects of the art that weren’t necessarily figurative or realistic. 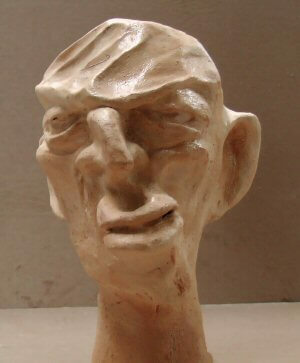 A few weeks after the session at Hayle I had a phone call from Arthur’s wife requesting more clay, it would seem that he had been quite prolific in his new passion for sculpting and was spending a good deal of time working on it too and it was proving beneficial for his mental well-being as he was much happier. The SAGE group activity was funded by Arts for Health Cornwall.